30th October 2009 – The corridor was the last unpainted area in the hold. So I started putting it in primer. It is a small area with many corners and sides. It took much more time then expected. 25th October 2009 – The floor was done in the bathroom and the furniture put on its place. Another room has been finished. I’m starting to wonder what I shall do the next weekends? 24th October 2009 – The bathroom received it’s third and final coat of paint. The sink was connected to the pump in the kitchen. I mounted the furniture for the bathroom and by the end of the evening, I painted the kitchen floor. A few more days and the hold is done! 22nd October 2009 – It is now the 5th day I’m living in the hold. It is a big chance. 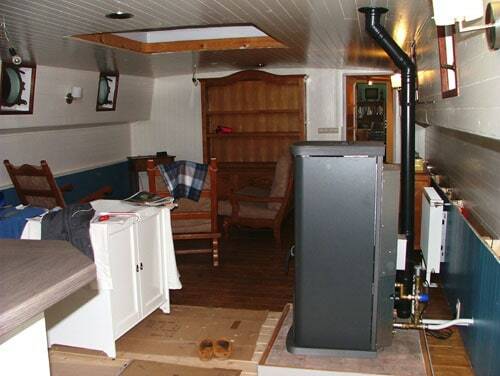 The area is bigger then the back accommodation, there is more comfort and most importantly: Heating! The central heating is working nicely! 18th October 2009 – In the kitchen a few more details needed painting. The bathroom received it first coat of paint. Since my deck is having a lot of rust, the worst places have been oiled to prevent getting it worse. It is now the second day I’m sleeping in the hold instead of the back accommodation. A big change! In the afternoon I visited a neighbour. 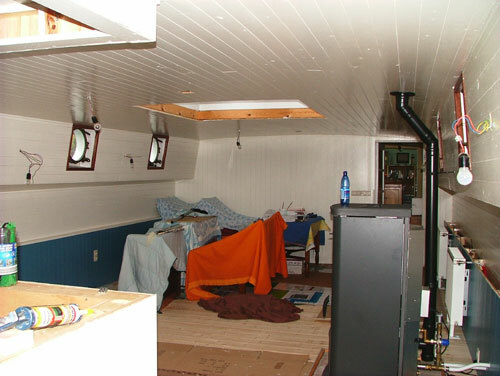 The previous owners of the ship had come over for some explanation of the ship and the engine. Great people with a lot of ship knowledge. 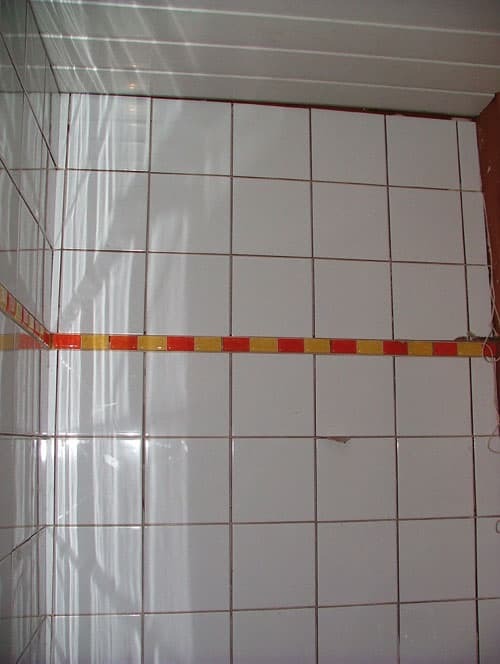 17th October 2009 – The bathroom was finished today. I had to do some small details. Since I’m sleeping in the hold this evening, I started the heating. 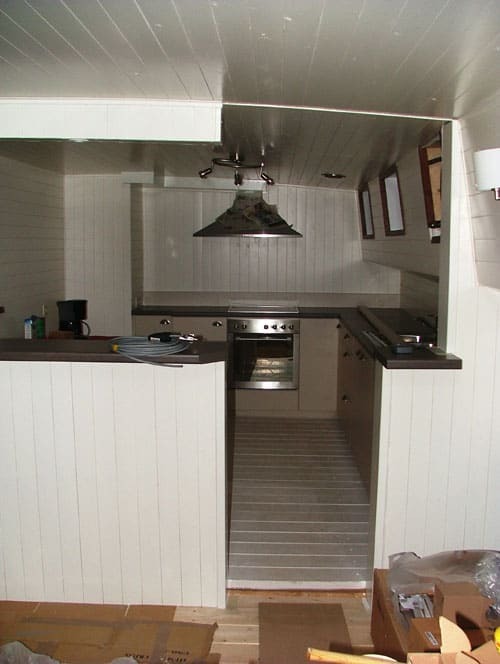 13th October 2009 – The whole kitchen is now finished and looking great. I can’t wait to get served in that kitchen (I can’t really cook so I’m desperately looking for someone to cook for me). 12th October 2009 – Last night I gave a second coat of oil on the floor. While the last bits were done on the shower, friends from Sluiskil came over to have a chat and a drink. It had been a while and it is always nice to hear other people’s opinion on your work. 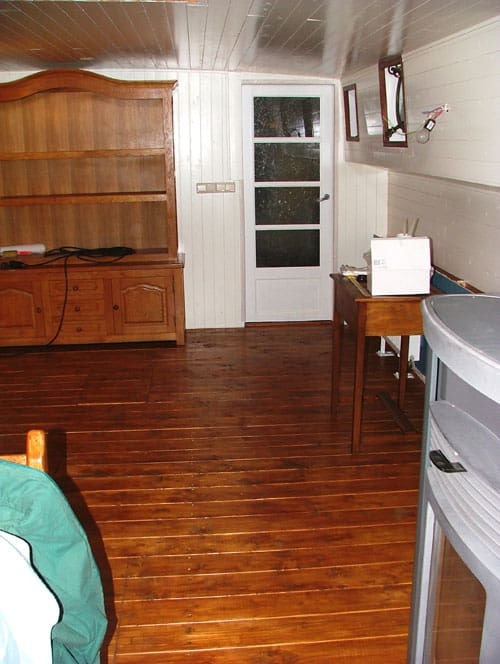 11th October 2009 – In the early morning I started oiling the floor of the living room. 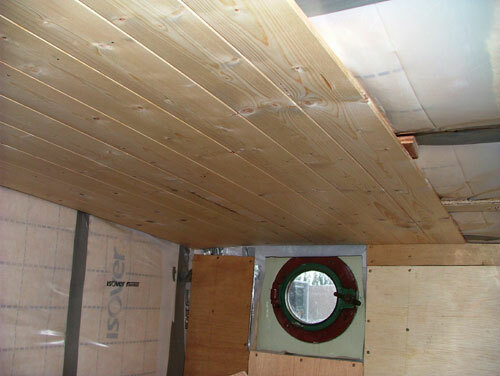 10th October 2009 – While the shower was being tiled, I spent time working on the electricity and the front cabin, putting some wood to make a nice ceiling. My mother painted the living room. By the end of the evening the living room was finished. 9th October 2009 – While the man of the kitchen was cutting his surface for the kitchen and bar, we painted the living room. In the evening I put some anti freeze in the system in case the heater fails and I’m not at home. 4th October 2009 – This is how I feel after working a few days continuously: broken. So I decided to go out and visit a second hand market in Eeklo. I found a bit of decoration and some tools.